DELETE -> the database engine finds and removes the row from the relevant data pages and all index pages where the row is entered. Thus, the more indexes the longer the delete takes. TRUNCATE -> simply removes all the table's data pages en mass making this a more efficient option for deleting the contents of a table. How are the commands replicated? Is the SQL command sent and processed on each subscriber? Or is MSSQL a bit more intelligent than that? Or, the nonclustered index deletions may be performed by separate operators, one per nonclustered index. In this case (known as a wide, or per-index update plan) the complete set of actions is stored in a worktable (eager spool) before being replayed once per index, often explicitly sorted by the particular nonclustered index's keys to encourage a sequential access pattern. TRUNCATE -> simply removes all the table's data pages en masse making this a more efficient option for deleting the contents of a table. Fewer locks may be needed. Truncation typically requires only a single schema modification lock at the table level (and exclusive locks on each extent deallocated). Deletion might acquire locks at a lower (row or page) granularity as well as exclusive locks on any pages deallocated. Only truncation guarantees that all pages are deallocated from a heap table. Deletion may leave empty pages in a heap even if an exclusive table lock hint is specified (for example if a row-versioning isolation level is enabled for the database). Truncation is always minimally logged (regardless of the recovery model in use). Only page deallocation operations are recorded in the transaction log. Truncation can use deferred drop if the object is 128 extents or larger in size. Deferred drop means the actual deallocation work is performed asynchronously by a background server thread. How do different recovery modes affect each statement? Is there is any effect at all? Deletion is always fully logged (every row deleted is recorded in the transaction log). There are some small differences in the content of log records if the recovery model is other than FULL, but this is still technically full logging. Execution plans are demand-driven pipelines: parent operators (to the left) drive child operators to do work by requesting a row at a time from them. The Sort operators are blocking (they must consume their whole input before producing the first sorted row), but they are still being driven by their parent (the Index Delete) requesting that first row. 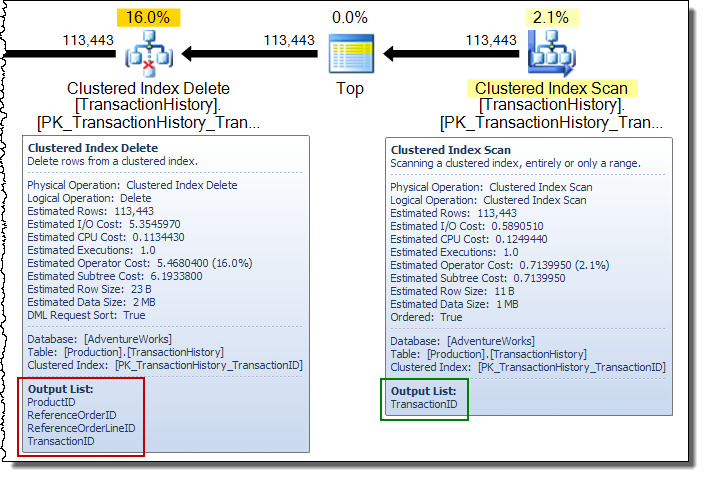 The Index Delete pulls a row at a time from the completed Sort, updating the target nonclustered index for each row. How are the commands replicated? Is the SQL command sent and processed on each subscriber? Or is SQL Server a bit more intelligent than that? Truncation is not allowed on a table that is published using transactional or merge replication. How deletions are replicated depends on the type of replication and how it is configured. For example, snapshot replication just replicates a point-in-time view of the table using bulk methods - incremental changes are not tracked or applied. Transactional replication works by reading log records and generating appropriate transactions to apply the changes at subscribers. Merge replication tracks changes using triggers and metadata tables. Not the answer you're looking for? Browse other questions tagged sql-server database-internals or ask your own question. Why use both TRUNCATE and DROP? How do I get back some deleted records? Why does DELETE leave a lingering effect on performance? How do DELETE / TRUNCATE affect table / tablespace? How do I return data from a table where the data is the max date of the previous month's data submissions (-1 of current date)? When to prefere a truncate over a batch-delete? Query 100x slower in SQL Server 2014, Row Count Spool row estimate the culprit? Race condition in DELETE with nested query? Why am I getting “Snapshot isolation transaction aborted due to update conflict”?